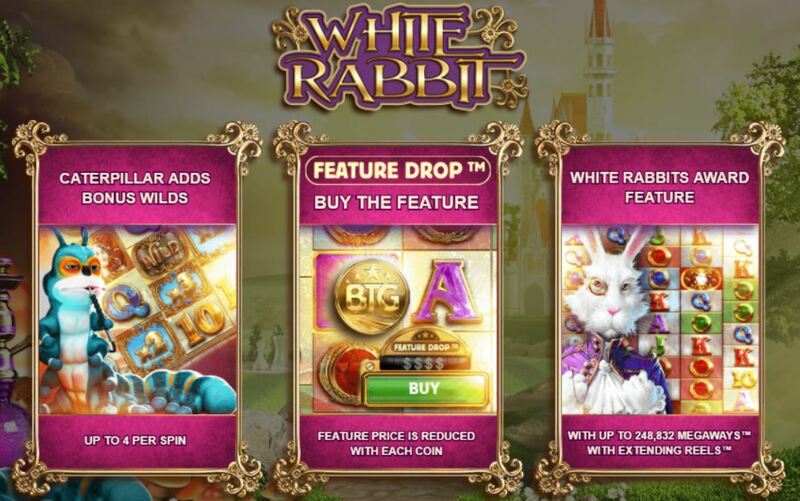 White Rabbit slot is another of Big Time Gaming’s high-volatility ‘Megaways’ games with seemingly Alice’s Adventures In Wonderland as the subject. We have similar sounds and symbols to Dragon Born and unlike Danger High Voltage variable reels of 2 to 7 rows on each, giving a range of 32-16807 ways each play. 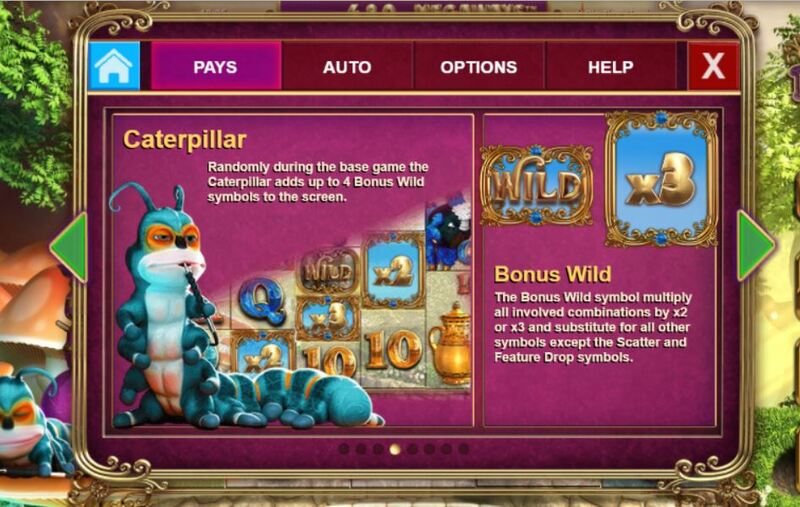 Wilds only appear unstacked (unlike the other symbols) on reels 2 to 5 but randomly the Caterpillar on the left may throw 1 to 4 on the reels which will have 2x or 3x multipliers on them and you trigger the free spins with the White Rabbit scatters on the centre 3 reels. 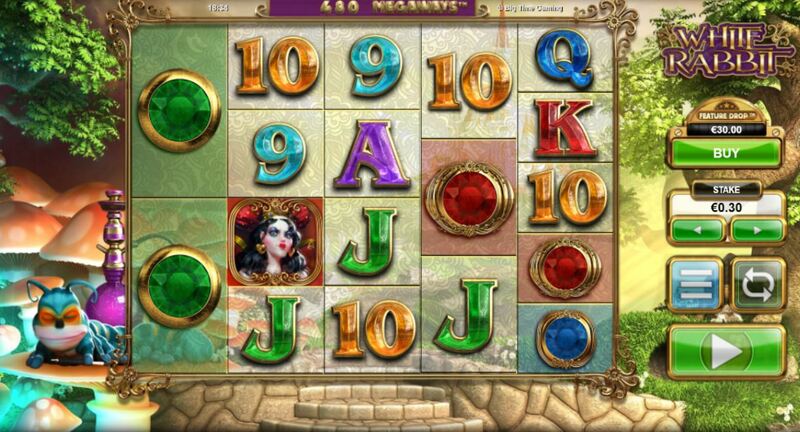 You get 15 free games which you begin with guaranteed reels of 5 rows to 7 each therefore a minimum of 3125 ways. 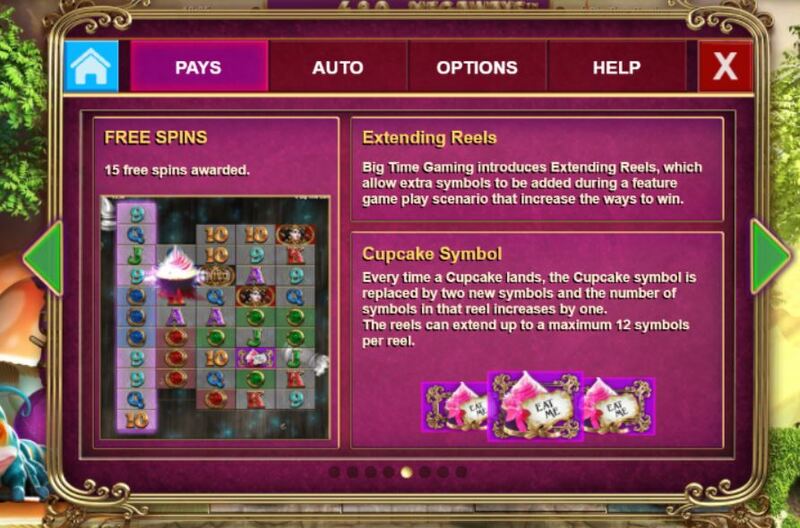 Cupcakes now appear on all reels increasing the minimum rows by 1 each time and should you get any reel up to 12 rows by landing 7 Cupcakes on it over the 15 spins, you will see an extra 3 to 12 spins plus the reel becomes a ‘Queen’ with extra Wilds and top-paying icons on it. This is repeated for every reel you can get to 12 rows and if you did all 5 you’d have the remaining spins with 248,832 ways and plenty of Wilds on them. You may buy the feature for 100x your bet at any time on White Rabbit slot, but less if the BTG Gold coins which randomly appear on the reels reduce the price and if you get the 100.00 down to zero it triggers anyway otherwise it’s 3-scatters on the centre reels and a normal trigger. White Rabbit slot has a very high 97.44% RTP if not using the feature buy-in, or 97.72% if you use the 100x bet buy-in every spin, so not much difference.